Today Savvy Working Gal and I are exchanging posts. She’s a great blogging friend, and has a lot of experience on the other side of the scholarship selection process. I’m so, so excited to have her amazing post here for you all. After you’ve read her words here, head over to her blog to check out what I wrote today! I am not sure why this is. We award two scholarships: one to a 4-year college student and one to a 2-year student. When there is extra money in our budget (which there is almost every year) we are authorized to award an additional 2-year scholarship if we have two equally qualified candidates. We also submit the 4-year scholarship recipient’s application to our National Foundation for consideration in their scholarship program. Two of our recent scholarship recipients have gone on to receive an additional scholarship from this foundation. For the past several years, we’ve received no more than ten applications for each category; once sloppily filled-out and ineligible applicants have been rejected, usually only 3-5 applications remain. The scholarships awarded have ranged from $500 to $2000. That may not seem like a lot, but with the cost of tuition these days every penny counts. My advice to you is to apply for every scholarship you are eligible for. The competition may not be as strong as you think. Our scholarships have specific requirements pertaining to accumulated credits and college year status. Each year we receive applications that do not appear as if they meet these requirements. One of our committee member’s takes the time to contact questionable applicants to verify eligibility. They are never eligible. You are wasting both our and your own time applying for scholarships in which you do not meet the requirements. Stop doing this. Intangibles can be anything we want them to be. I was initially instructed this is a gut feel or something special we see in an applicant. Once the master spreadsheet has been completed we have a committee meeting. Each applicant and their corresponding score are discussed in detail. We talk about what we like or disliked on an application and why we scored them as we did. Sometimes the master ranking sheet stays as is and other times a committee member points out something the rest of us did not see and the scores are changed. We then vote on whether the top scorer should be awarded the scholarship. If the majority agrees the scholarship is awarded. We do have the option of not awarding a scholarship if we feel we do not have a worthy recipient. Unfortunately, this has occurred. Is the application filled out in its entirety and is it signed. You would not believe the number of applications we receive where entire sections are left blank. Transcripts are not required to be submitted with the application, but you will be asked to provide them if you are awarded the scholarship. If you do not provide corresponding documentation your scholarship award will not be granted. I won’t sugar coat it – good grades do make a difference. This is the category most often skipped. Please write something here. You will not receive our scholarship if you leave this question blank. If you think back on your life you probably can come up with something. Have you volunteered at your church? Worked at a food bank in high school? Participated in sports? We once had an applicant write she works full-time, goes to school and takes care of her disabled child. She currently does not have time for extracurricular activities, but when she was younger she did XYZ. She was awarded our scholarship. Again make sure you fill this one out. Also, total the column and check your addition. It is common for intangible scores to be lowered when sloppiness and addition errors are found in this category. Our current application asks for a financial aid transcript if available. In prior years, I don’t recall ever receiving one and we have never asked for verification, but that doesn’t mean other scholarship committees do not. If we have two like applicants, the one with the greater financial need is usually awarded the scholarship. The best advice I can give you is to be a real person. Our committee chair despises essays where the applicant writes their goal is to be a CFO or a partner in ten years. (Many really do say in ten years.) Honesty and a personal story count for more than lofty goals. Provide an original story and you will stand out from the crowd. Our committee chair also has a real aversion to essays that are not typed with double spacing. She added a requirement before I joined the committee stating hand written essays will not be read. Make sure your essay is easy to read by typing and double spacing your submission. Both of the scholarship recipients who went on to receive the National Foundation’s scholarship had outstanding essays. One wrote about being a member of a non-profit group and her plans to use her degree to help the recipients of this group’s services improve their financial lives and to help them start and maintain their own businesses. The other recipient wrote about the mistakes she had made in her life: dropping out after her freshman year, what she learned from this and what she was doing to turn her life around. We were happy to receive a letter from her this past year informing us she had graduated and been hired by a prestigious company in Chicago. She went on to thank us for awarding her the scholarship stating it had been a life changing event. A hand written thank you note sent to an organization that has given you a scholarship goes a long way. We read them at our promotional events and include them in our newsletters – your name is included. Keep us informed of your education and career progression. We want to see you succeed and are more than happy to help mentor you when we can. Who Does Free Community College Actually Help? This entry was posted in College Money on October 24, 2014 by femmefrugality. This is really helpful information! Thank you! Agreed! So lucky to have her contribute this information! So valuable! Thanks, Melanie! Is it to late to apply for your organizations scholarships for fall 2015? I’m a college freshman majoring in Environmental Engineeing at Arizona State University. I’m still applying for scholarships no matter the amount, college is expensive. Very interesting. Searching out scholarships from professional organizations seems like worthwhile effort. 100%, Toni. If the money’s there, seek it out! I agree that you should apply for EVERYTHING. I was a terrible public speaker in high school, but I applied for an oratorical scholarship where you had to present a 5 minute speech on your favorite Amendment. There was a first, second and third place prize. Three of us showed up – guess who got the scholarships. I had a student ask me about our scholarship at a recent event. I didn’t want to tell her we don’t get very many applicants, so instead I kept encouraging her to apply and told her your chances may be good. Another problem we have is that our contacts at some of the schools keep changing, so we are never sure if students are aware of our scholarships. I highly recommend searching the web for scholarships by major, school or state. This is so interesting! I wish I had known this when I was applying to schools. I always assumed competition was so fierce, I rarely bothered to apply. I have to share this with my high school relatives! Thank you! My first shoot at college, I assumed the same thing so I barely applied to any. Mistake! Second time around I applied to everything I could and got awarded every time. Hope this helps your relatives! Thanks for sharing! 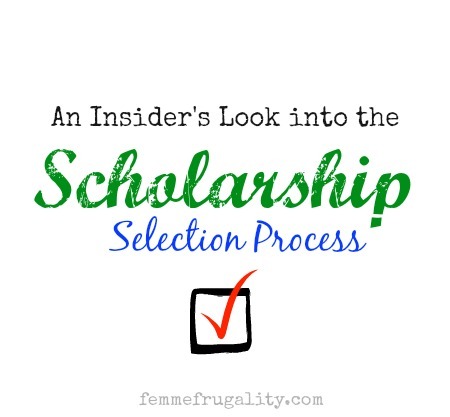 That’s the crazy thing about scholarships, is that not many people actually apply for them, so your chances of getting it and you meet the criteria are far greater if you apply. I applied for a small scholarship in 2011 and even though my grades weren’t great, I still got it! That’s awesome! Grades are important, and like Savvy said, they matter, but I found the weighting of them interesting! Much belated congrats on being awarded! If only I’d had this about 10 years ago! I was such a schmuck! I literally didn’t try because I thought all the brainy kids would’ve swooped in and nabbed those scholarships by the time I began filling out the first page. Awesome advice! These are wonderful tips. My son is a High School Junior and he argues with me all the time that his grades are just FINE, thank you, and that he WILL be able to get a scholarship even though his grades are less than stellar. But it is heartening to hear that the competition may be relatively thin. And he has LOADS of extracurricular stuff that would look great on a resume – Scouts, Youth group, food bank, soup kitchen. It’s nice that they take that into account, maybe to counterbalance the grade issue.